Rioters have looted several shops owned by foreign nationals in a poor neighborhood of South Africa's largest city early Saturday. Police fired rubber bullets in an attempt to stop the xenophobic unrest spreading across the province during the week. 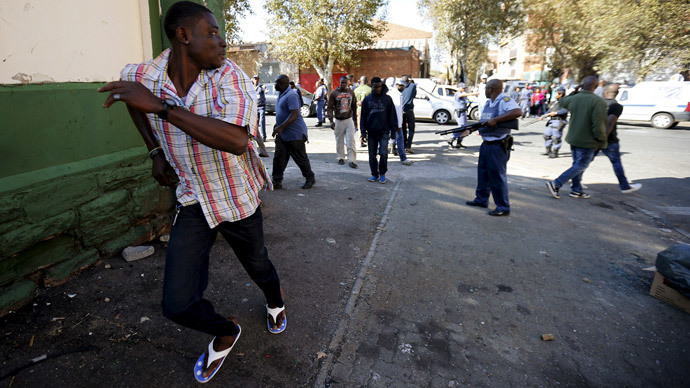 Violence first erupted in the port city of Durban on Tuesday. At least two foreigners and three South Africans were killed as migrant-owned shops came under attack by rioters armed with machetes and petrol bombs. Another foreign national was attacked and killed in his home in the town of Verulam on Wednesday. Angry South Africans are accusing foreigners of taking their jobs and committing crimes. Police, ordered by the president to work round the clock, arrested at least 112 people across the KwaZulu-Natal Province in connection with the attacks, but failed to stem the violence as it spread to Johannesburg. "They are robbing me, and they broke into the shop last night, around 9 o'clock and then we fixed it and we left it. But today again they broke into the shop, and they took everything," Kamal Uddin, a shop owner from Bangladesh, told Ruptly video news agency. After having his store destroyed twice within 24 hours, he says he has no choice but to leave South Africa: "Now I have to go back to Bangladesh. I'm going to close down everything and then I'll have to leave the country." He is not the only one forced to abandon his livelihood. About 8,500 people are now hiding in refugee centers, makeshift shelters and police stations, according to aid organization Gift of the Givers. “I came to this camp because where I was staying, they were going to beat us like they did in 2008. I was here so I know the story. So that's why I ran for my life", said Sheu Moyo, a Zimbabwean refugee, referring to a previous outbreak of violence against migrants, which spread out from the township of Alexandra and saw 60 people killed and 6,000 displaced. Some foreign nationals chose to retaliate. Nigerians in Durban built barricades out of tires and debris to fend them off. South Africa's President Jacob Zuma has condemned the attacks, saying they "violate all the values that South Africa embodies, especially the respect for human life." However, statements by other South African public figures served to fuel the xenophobia. The President's son Edward Zuma said earlier this month: "We are sitting on a ticking time bomb of them [foreigners] taking over the country." And Zulu King Goodwill Zwelithini, the cultural leader of the native Zulu people, reportedly said that foreigners should "pack their bags and leave." The violence was condemned by the president of neighboring Zimbabwe Robert Mugabe. Speaking on behalf of the African Union and Southern African Development Community, both of which he currently chairs, Mugabe said: "The act of treating other Africans in that horrible way can never be condoned by anyone." About a million Zimbabweans live in South Africa, having fled the economic crisis and political instability at home.